& Sector Skill Council (SSC) has started allocating targets for the Pilot phase (June) , Based on performances of an individual Training Partner, further Targets will be allocated in the Month of July. Enable and mobilize a large number of Indian youth to take up skill training and become employable and earn their livelihood. Increase productivity of the existing workforce and align the training and certification to the needs of the country. Reward candidates undergoing skill training by authorized institutions at an average monetary reward of Rs. 8,000 (Rupees EightThousand) per candidate. Benefit 24 lakh youth at an approximate total cost of Rs. 1,500 Crores. Currently, only a very small proportion of India’s workforce has any formal skill training. Not surprisingly therefore several sectors of the country’s economy face shortage of skilled people and are mired with low productivity levels due to poor quality of workforce. At the same time, large sections of the country’s youth are looking for economic and livelihood opportunities. In this context, skill development has become a key priority area for the country. This is not only essential for economic development, but would help to fulfil youth aspirations for good quality, better paid jobs and self-employment opportunities. This would also enable the country to take advantage of its favourable demographic profile. With a large pool of skilled people, India has an opportunity to become a skill provider for the world, particularly the ageing developed world. The Scheme will provide monetary incentives for successful completion of market-driven skill training and certification to approximately twenty four lakh youth in in a span of one year from the date of implementation of the scheme. This Scheme shall be implemented through Public-Private and Public-Public partnerships. NSDC will be the implementing agency for this Scheme. All trainings and certification under Recognition of Prior Learning will be specifically oriented for developing skills in specific growth sectors. Assessment and training bodies for all purposes of the Scheme will be separate and no overlap of roles will be allowed to maintain transparency and objectivity. The monetary reward will be wholly funded by the Ministry of Skill Development and Entrepreneurship, Government of India and will be affected through bank transfer to the beneficiaries’ accounts. For facilitating the smooth disbursement as prescribed under the scheme, the entire money along with the additional implementation fund will be transferred to National Skill Development Fund for further utilization by NSDC. Definitions of terms and expansions of acronyms used in this document are listed in Annexure 1. Training will be done against standards (National Occupational Standards – NOS and Qualification Packs – QPs for specific job roles) formulated by industry-driven bodies, namely the Sector Skills Councils (SSCs). Based on assessment of skill demand and the ‘Skill Gap Studies’, target for skill training would be allocated to sector skill councils by NSDC in consultation with the SSCs, States/UTs and the Central Ministries/Departments under the oversight of the Steering Committee of PMKVY. Target for skill training would be aligned to the demand from the Central Government’s flagship programmes, such as – ‘Swachh Bharat’, ‘Make in India’, ‘Digital India’, ‘National Solar Mission’ and so on. NSDC training partners undergo due diligence before being registered with NSDC. Government affiliated training centres and other training partners will be approved by the SSCs on the basis of guidelines issued by NSDC. Under PMKVY, even the government affiliated training providers will undergo due diligence as per the process manual. Each training partner would be responsible for its entire franchisee network and the infrastructure of training centers. The same will be part of the monitoring process. Only first level of franchising would be allowed but the same should be declared in advance. While, the thrust would be on outcomes in terms of third party assessment/certification, training providers to focus on improved curricula, better technology enabled pedagogy and upgrading the capacity of instructors to enable the overall ecosystem for high quality skill training in the country. All skill training would include soft skill training, personal grooming, behavioural change for cleanliness, and good work ethics as a part of the training curricula. Third party assessments for skill training will be done based on national (and often) global standards. Under PMKVY, trainees with prior experience or skills and competencies will be assessed and they will also be given monetary rewards for undergoing assessments. This will be an important step towards recognising the skills possessed by workers working in the informal sector and their inclusion. This will also facilitate the process of skill upgradation and re-skilling of the existing workforce. The focus of RPL would be on those job-roles/sectors in which it is most desired. is availing of this monetary award for the first and only time during the operation of this Scheme. Monetary reward for various job roles within a sector varies for different as per job role levels. This amount would be arrived at after taking various factors like cost of training, willingness of trainees for pay and other relevant factors into consideration. Higher incentives will be given to training in manufacturing, construction and plumbing sectors. 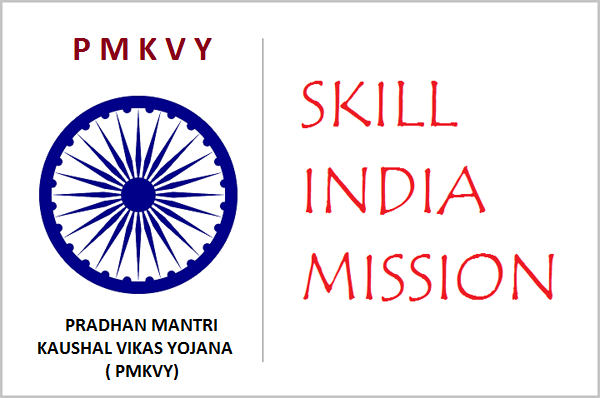 PMKVY will follow complete transparent funding of skill training without any intermediaries with monetary rewards directly transferred to the trainee’s bank account. Aadhaar number will be used for unique identification of each candidate. Awareness building & mobilization activities would be carried out with the involvement of local State and district governments as well as involve Members of Parliament in the activities to ensure greater outreach and ownership. A ‘camp-based’ approach by organizing ‘Kaushal Melas’ to disseminate information about various skill training options, outline possible career paths and income generation potential once the training is imparted would be held in every district. Efforts will be made to ensure that the coverage of the scheme is across all the 543 constituencies in India. Skill Yatras will be explored to take awareness to the hinterlands and include live demonstration of skills. Non-governmental and community-based organizations would be involved in this activity to ensure widest possible reach and create an environment for skilling in the country. This would be supplemented with specialised and standardized branding and communication packages through mass media and social media. Periodic surprise checks and audits of the mobilisation phase would be conducted to ensure its continued efficacy. A mentorship programme will be created in order to support trainees who have successfully completed the training programme and are in the process of looking for employment opportunities. Training providers will be responsible for identifying mentors who will support and guide trainees in the post-training phase. These mentors will provide career guidance and counselling for trainees once they have completed training and will also help connect them to employment opportunities. This mentorship programme will also facilitate the tracking of trainees in the post training phase. To monitor the training process, SSCs will be tasked with verifying and recording details of all training centres on the Skill Development Management System (SDMS), and ascertain quality of training locations and courses through certified assessors during the time of assessments. SSCs will also be responsible for certifying the training curriculum and for ensuring that it is aligned to QPs of job roles. In addition, SSCs will be tasked with certifying all trainers for the Scheme. Audit checks and surprise visits to training centres will also be conducted to ensure enhanced monitoring. Assessing process could be more technology driven and could also be carried out in CCTV environment. Trainee feedback based on validated standard format verified at the time of assessment will become the key element of the evaluation framework to assess the effectiveness and scale up of PMKVY in future. A proper grievance redressal mechanism would be put in place. Online Citizen’s Portal would be set up to disseminate information about PMKVY. This would also serve as a platform for redressal of grievances. The portal would also include a complete database of all available courses and training centres under PMKVY. The scheme will be implemented through the National Skill Development Corporation (NSDC). Steering Committee for PMKVY would be responsible for providing direction for implementation of the scheme. The Steering Committee will be empowered to review the framework and make suitable modification as and when required in the scheme. The Committee will oversee dynamic fixation of targets for skilling, amount of monetary reward by job roles, activities related to awareness building and trainee mobilization, mentorship support. The Steering Committee may appoint sub-committees at national or state level (s) to assist in exercise of its functions. It is recommended that sub-committees at the district level are also formed especially to focus on awareness and mobilization activities, as well as for monitoring of the scheme. NSDC – The National Skill Development Corporation (NSDC) has been instituted to foster private sector initiatives in skill development. It is a Private Public Partnership (PPP) organization with representatives of Government and Industry Associations on its Board. SSCs – Sector Skill Councils (SSCs) are industry-led bodies, who would be responsible for the defining the skilling needs, concept, processes, certification, accreditation of their respective industry sectors. The SSCs shall prescribe the NOSs and QPs for the job roles relevant to their industry, and shall work with the NSDA to ensure that these are in accordance with the NSQF. NSQF – The National Skill Qualification Framework (NSQF), would be a descriptive framework that organizes qualifications according to a series of levels of knowledge, skills and aptitude. These levels are defined in terms of learning outcomes i.e., the competencies which the learners must possess regardless of whether they were acquired through formal, non-formal or informal education and training. It is, therefore, a nationally integrated education and competency based skill framework that will provide for multiple pathways both within vocational education and vocational training and among vocational education, vocational training, general education and technical education, thus linking one level of learning to another higher level to enable a person to acquire desired skill levels, transit to the job market and return to skill development to further upgrade their skill sets. NOSs – National Occupational Standards (NOSs) specify the standard of performance an individual must achieve when carrying out a particular activity in the workplace, together with the knowledge and understanding they need to meet that standard consistently. Each NOS defines one key function in a job role. In their essential form, NOSs describe functions, standards of performance and knowledge/understanding. QPs – A set of NOSs, aligned to a job role, called Qualification Packs (QPs), would be available for every job role in each industry sector. These drive both the creation of curriculum, and assessments. These job roles would be at various proficiency levels, and aligned to the NSQF.NOSs and QPs for job roles in various industry sectors, created by SSCs and subsequently ratified by appropriate authority, would be available online and updated from time to time. sir you were saying pmkvy will be launched on 21 may sir please give us only right information,thank u.
Sir,i have completed my b.sc in stream of mscs .will u give a suggestion that what course is suitable for me to do ?? ?